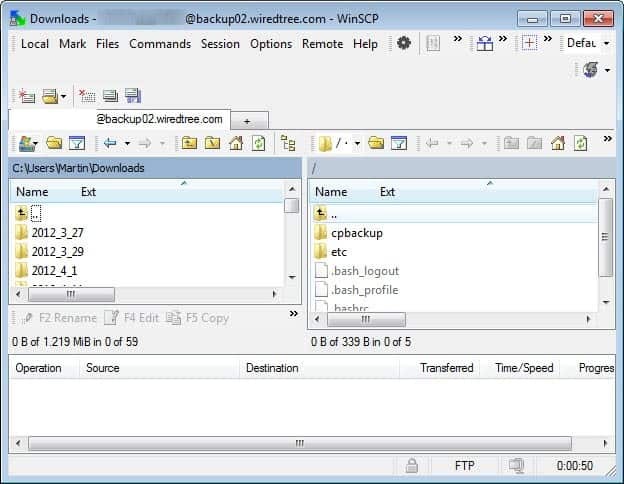 WinSCP is a popular sftp, scp and ftp client for the Windows operating system. I have been using the program in the past years to connect to various servers and sites that I own or administrate. The program makes available an easy to use dual-pane interface that is ideal for transferring files from the local system to the server and vice versa.WinSCP is well integrated into the Windows operating system, supporting drag and drop and other file operations among other things. System and network administrators can make use of the advanced feature set that it makes available, including batch file scripting, directory synchronization and public key authentication. Support for taskbar jump list on Windows 7. Support for MLSD/MLST FTP commands. .NET assembly built around WinSCP scripting interface. A full list of changes is available on the history page over at WinSCP.net. Please note that the majority of features, changes and bug fixes have found their way into the program in one of the beta and release candidate builds that have been available in the past months. The latest version of the file transfer application is available for download at the project website. The software is compatible with all recent versions of the Microsoft Windows operating system. Please note that it is available as a portable and setup on the page. The source code is available as well. Existing users can upgrade the program, use the portable version or install the program in another location on the hard drive. If you have saved sessions in the WinSCP.ini file, I suggest you backup the file before you do that though to be on the safe side of things. Updated, one of my faves. One of the most stable ones of its kind in my experience. Yeah I never looked back after discovering this gem. administrate.’ Could you let me know which sites apart from gHacks do you own or administrate ? So that i could follow them as well ? Praveen, I do not think you’d be interested in most of them. The sites that may interest you are loginhelper.com and atechgirlslife.com. Hi Martin, dumb question probably, but how do you launch the gui without necessarily saving\logging into a server\site? I get this login screen but I just want to have a look at the gui first. I suggest you us a dummy account, e.g. http://ftp.mozilla.org, port 21, anonymous. Not sure if there is a way to look at the interface without having an account set up first. Still I find it totally absurd that you cannot reach the interface without logging on a site for such a praised software.